The key to making a figure-flattering top with minimal shaping is IN creating a soft, loose, fluid fabric. 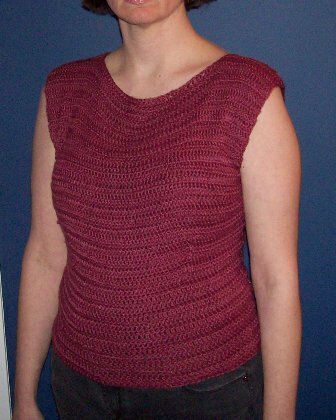 To achieve this, I chose a soft DK-weight yarn, a larger than recommended hook, and a stretchy stitch pattern. The alternating rows of front loop dc and back loop dc make a gently rippling effect, unlike the ridged look of the more familiar back loop dc pattern. This design is essentially an elongated, slightly misshapen rectangle with a hole in the middle. Top is loose fitting with about 2″ positive ease. 15.5 st and 7 rows = 4″ in st. pattern. Remember to check your gauge. Be sure to block your swatch before measuring. This is a stretchy stitch pattern and will grow. Top is also likely to grow vertically with wear. Try on to check sizing as you go, particularly when you get to the neck opening. Heads don’t necessarily follow standard sizing. The extra stitches added at the neck opening and following decreases are intended to provide some extra room at the bust for those of us who need it. Those who wear a B cup or smaller might want to omit this. Front Loop Double Crochet: Yo, insert hook under front loop of next ch or st; yo, pull thru 2 loops, yo, pull thru 2 loops. Back Loop Double Crochet: Yo, insert hook under back loop of next st; yo, pull thru 2 loops, yo, pull thru 2 loops. Front Loop Double Crochet Two Together (decrease): (Yo, insert hook under front loop of next st, yo, pull thru 2 loops) twice; yo, pull thru 3 loops. (Ch 3 counts as first st for all rows) Bldc in 2nd st and each st across to end, bldc in top ch of beginning ch 3. Ch 3, turn. 62 [70, 78, 86, 94 sts) sts). Row 3 Fldc in 2nd st and in each st across to end, fldc in top ch of beginning ch 3. Ch 3, turn. 62 [70, 78, 86, 94 sts) sts). Row 4 Bldc in 2nd st and each st across to end, bldc in top ch of beginning ch 3. Ch 3, turn. 62 [70, 78, 86, 94 sts) sts). Fasten off and weave in ends. Seam sides leaving an opening of approx 7 – 8″ for armholes.